Redneck Diva: What, Me Worry? I woke up worrying this morning. My heart and mind were heavy from the second I opened my eyes. Before I ever even got out of bed, I prayed. Even though God knows my concerns, needs and yes, worries, I went ahead and just, you know, reminded Him. These are legitimate needs, not wants. As I shuffled into the living room to turn on the pellet stove, I again went to God and said, "You know, God, if You could just....help me out here....that'd be great." And on I continued with my worrying and figuring and mental evaluation of the situation. I even went to God again and said, "Hey, here....look at this....I have a solution for You!" but still I felt an unease in my heart, my soul. That was not the solution, apparently. 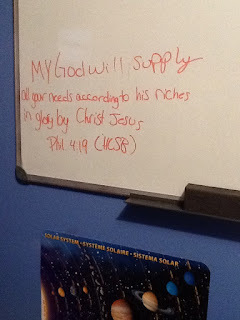 It's been on the board for a few days now and I have noticed it and thought, "Aww, how sweet, Bug wrote a scripture," and wondered why. Now I know why. It was for me. Today. Those needs are still there, but I know that God is going to take care of it the way He sees fit. Not the way I see fit. 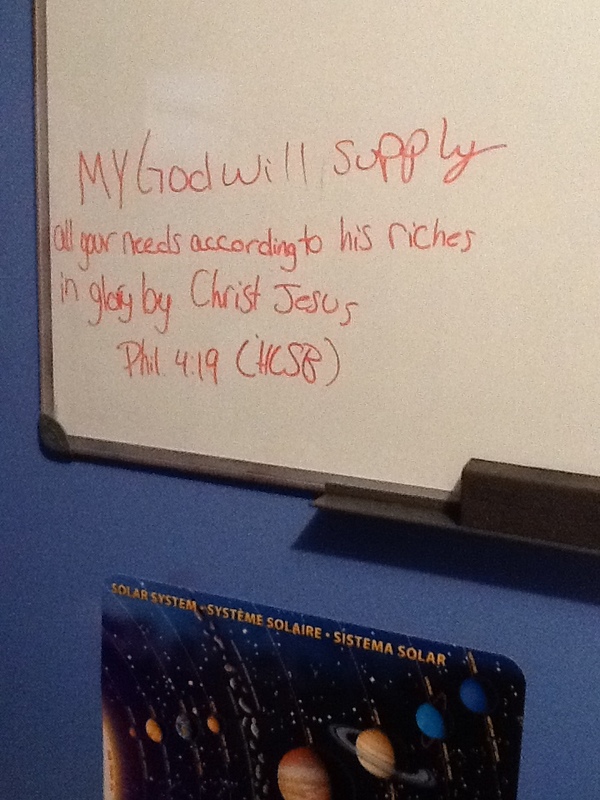 He will supply all all my needs. He doesn't need my planning, suggestions and input because He already has this situation under control. And I am trusting in that.